A tired, but happy group at the end of the day. 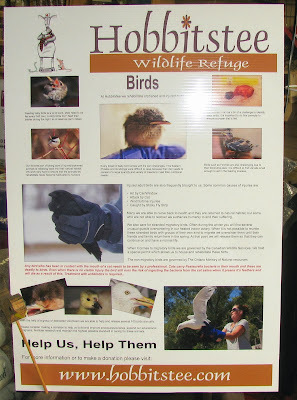 Last Saturday, Rob and I spent the day at Wild Birds Unlimited. Now, it's nothing new for Rob and I to loiter around our friends, Jim and Lynda's store, but this day, we were there for a good reason. 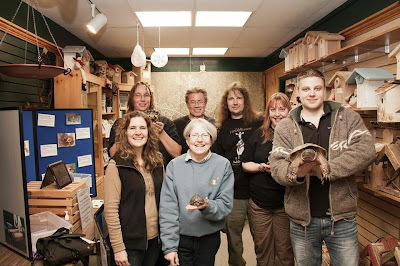 We were helping to raise money for Hobbitstee, a non for profit wildlife rehabilitation centre. 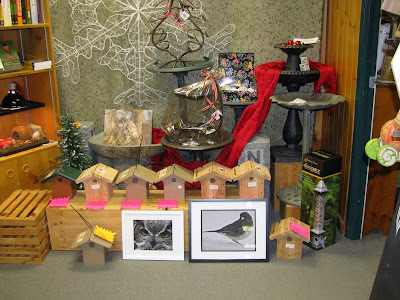 Our goal for the day was to raise $1500, that's enough to build 2 songbird aviary's, one for smaller birds, and one for larger. These pre-release enclosures require special materials, as metal and other materials are very damaging to a birds feathers and can render them unable to fly. Jim and Lynda donated lots of great raffle prizes from the store, and others donated prizes as well. 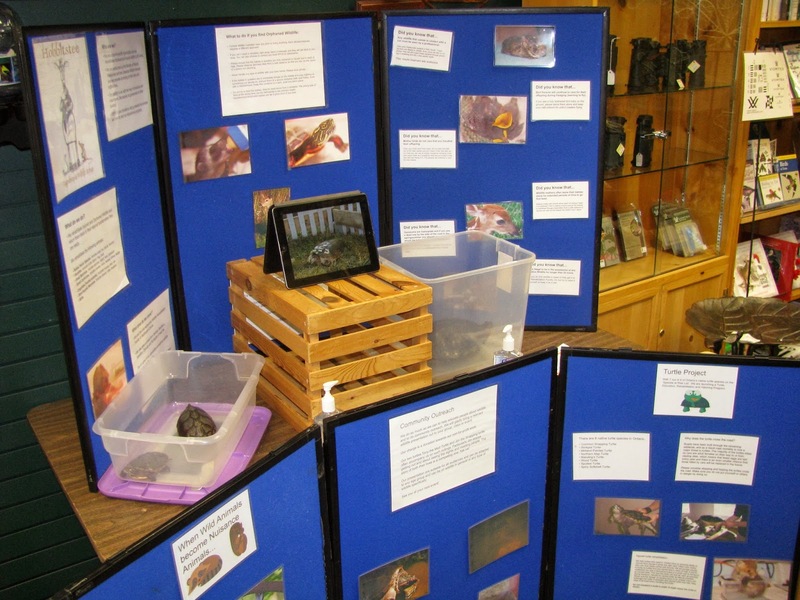 There were snacks and coffee, and Hobbitstee brought a few of their educational animals to help educate the public about wildlife and why they belong in the wild. It was a busy, fun and educational day! We didn't quite reach our goal, raising $784 in the store. But, that is enough to build 1 much needed songbird aviary, and we were all thrilled. 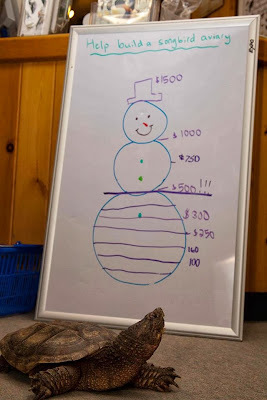 Chantal, the founder and licensed wildlife rehabilitator at Hobbittstee has been keeping me updated on donations that have been coming in via email donations specifically for the songbird aviary's since the event and at last count we are at $875! Help us, help the birds! Bilbo is a groundhog, and will never be returned to the wild. 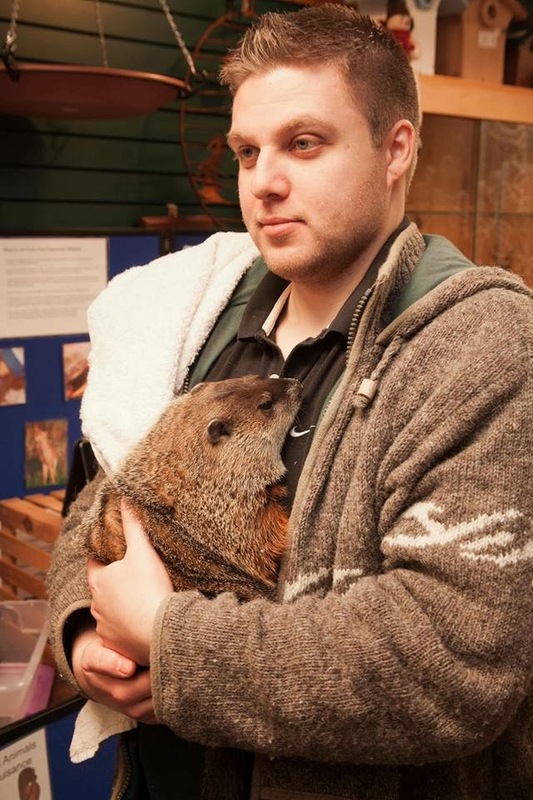 He was stolen as a baby from his mother's den, after she was shot and killed, on purpose, so the the baby groundhogs could be taken because this person heard groundhogs made good pets. The Ministry of Natural Resources confiscated the groundhogs after learning of the incident. Only one groundhog had survived, and I had the privilege of naming him. It's a heartbreaking story and makes me angry, but also reinforces why the need for places such has Hobbitstee exist. Bilbo will spend the rest of his life as an educational animal, helping people to understand that wildlife belongs in the wild, and it is illegal to keep native wildlife has pets. Lot's of great raffle prizes! "Jim", the snapping turtle, looks up to see how we're doing. Rob and I would like to personally thank everyone who came by the store that day and purchased raffle tickets, brought items off the wish list or made a straight donation. It was nice to see so many of our friends come out and support Hobbitstee. If you'd like to help, you still can, just email a money transfer to chantal@hobbitstee.com with "Songbird Aviary" in the subject line.